This painting was used as cover illustration (1986 left) for the introductory textbook Ethics by Piers Benn (Fundamentals of Philosophy. Series editor: John Shand. Routledge 1998) but appears nowhere else. 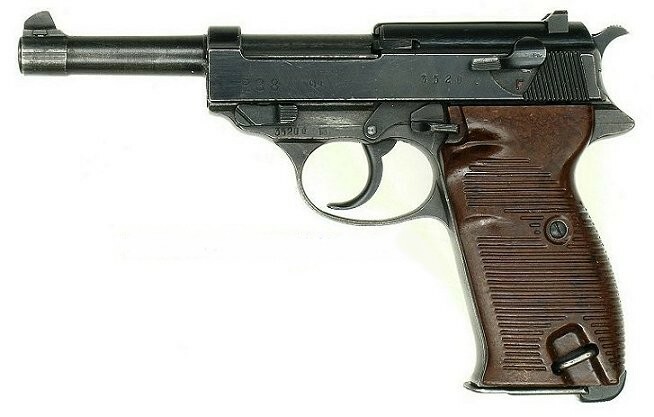 Assuming the title refers to the Walther P38 (right), I wonder why it was selected. There’s a passing mention of the problem of deciding whether to ban handguns on p 191, but nothing else pertaining to guns hinges on the reference. Pericoli, a Milanese watercolourist, has a cartoonist’s penchant for distortion. 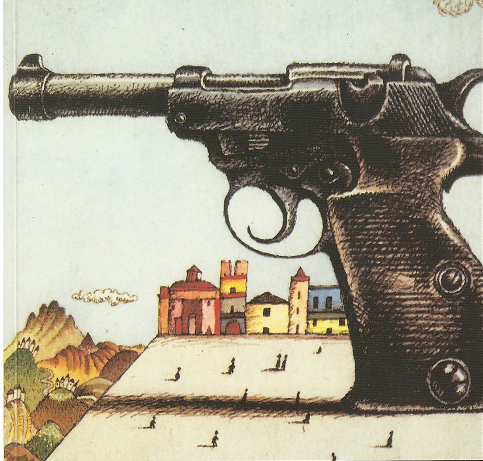 Perhaps the shadow indicating the scale of the gun in relation to the people and buildings is a comment on its power. Speaking as the Editorial Director of a publishing company – http://www.bretwaldabooks.com – I would guess that the design department were told to find a cover pic, had a limited budget and/or limited time and went with the first striking image that they found. Whether a cover is strictly speaking relevant to the contents of the book is sadly irrelevant to many designers who want to show off how good they are as designers and pay little attention to the editorial needs of author or reader. Of course, I might just be being cynical. I bet you’re right. I like Pericoli, especially the watercolours, but he is a commercial artist. I guess that’s why I like him.